Being out of the country, I will definitely be missing the turkey, pumpkin pie, and all the good food on this Thanksgiving Day. Beyond the food and the other fun, warm, and joyful details of today’s celebration though, there’s the real and, I must say, truly beautiful meaning that lies at its core. The gospel read at Mass tells us that what we’re celebrating today lies at the heart not only of life, but of our very relationship with God. And it’s a relationship that’s defined by two things: our gratitude for God’s many blessings, and our openness to even more blessings from him. Ten lepers come to Jesus asking that they be healed, ten men who were rejects of society—the gospel tells us that when they approached Jesus, they had to stay some distance away from him. That’s because Jewish law stipulated that lepers may not even come near healthy people. They were outcasts and often were not even regarded as persons. And yet Jesus reached out to them and healed them. Gratitude is an important part of our relationship with God because God reaches out to us no matter what our state in life might be: strong or weak, good or sinful, God comes to us and offers us his love. And the only response we can truly give in return is our thanks. Ten were granted their request, but only one returned; and Jesus noticed that. But while ten were freed from their ailment, only the one who came back to say thank you was truly healed. “Stand up and go”, Jesus tells him, “your faith has saved you”. The nine ungrateful ones may have had their bodies healed, but the thankful one found healing in body and soul. His thankfulness did not only restore his health, it made him whole. The nine ungrateful men probably thought that since they had already received what they wanted, they had nothing more to gain by going back and thanking Jesus. And that’s where they were wrong. For as the one grateful leper discovered, by going back and giving thanks, one actually stood to receive even more. And that perhaps is the most remarkable and even mysterious thing about gratitude. 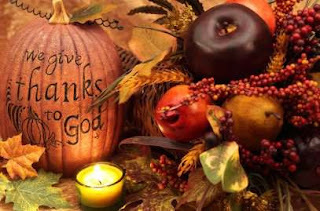 The more we give thanks for the blessings we receive, the more abundantly the blessings flow. The more we return to God and thank him for his many gifts, the more the gifts come—and like the grateful leper, we discover that as our gratitude increases, God’s generosity increases even more. Gratitude is one of the most important keys unlocking the fullness of life. As we celebrate this wonderful holiday, as we return to our homes to be with our families on this Thanksgiving Day—let us remember the story of the grateful leper in the gospel, and make his story our own. Let us thank God for his many gifts. And let us remember that gratitude is a recognition of God’s blessings, and an invitation for more. The more we are thankful, the more we will be given.